, esq. 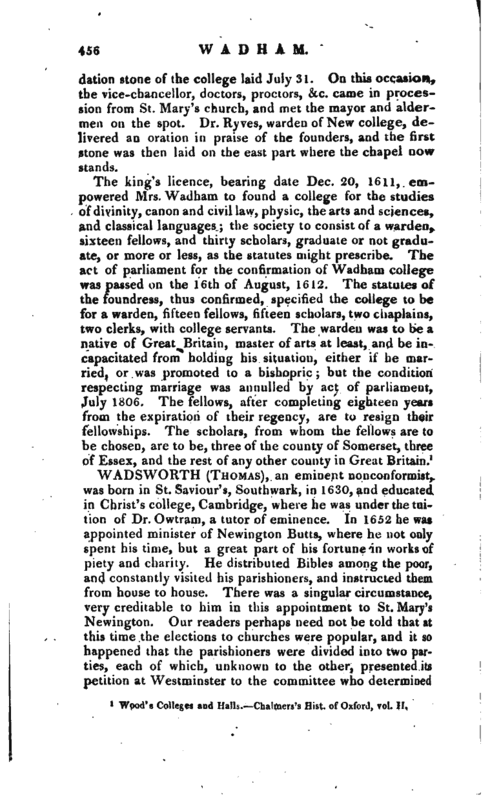 of Edge and Merrifield, in Somersetshire, in which county he was born, the founder of Waclham-college, Oxford, was a descendant of the ancient family of YVadhams of Devonshire; but the period | of his birth is not known, nor have we many particulars of his personal history. According to Wood, he was a gentleman-commoner either of Christ-church, or CorpusChrist! college, where he is supposed to have been admitted about 1548. He inherited an estate which he increased to more than 3000l. a-year, and accumulated about 14,000^. in money. A large portion of this property he resolved to devote to some foundation of public utility. His first intention is said to have been to found a college at Venice for such Englishmen of the Roman catholic persuasion as might wish to enjoy their education and religion, now no longer tolerated in England. 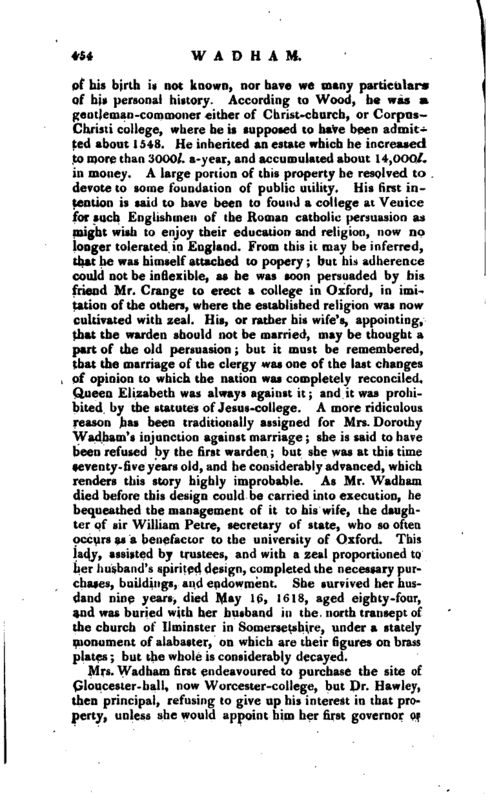 From this it may be inferred, that he was himself attached to popery; but his adherence could not be inflexible, as he was soon persuaded by his friend Mr. Grange to erect a college in Oxford, in imitation of the others, where the established religion was now cultivated with zeal. His, or rather his wife’s, appointing, that the warden should not be married, may be thought a part of the old persuasion; but it must be remembered, that the marriage of the clergy was one of the last changes of opinion to which the nation was completely reconciled. Queen Elizabeth was always against it; and it was prohibited by the statutes of Jesus-college. A more ridiculous reason has been traditionally assigned for Mrs. Dorothy Wadham’s injunction against marriage; she is said to have been refused by the first warden; but she was at this time seventy-five years old, and he considerably advanced, which renders this story highly improbable. As Mr. Wadham died before this design could be carried into execution, he bequeathed the management of it to his wife, the daughter of siv William Petre, secretary of state, who so often occurs as a benefactor to the university of Oxford. This lady, assisted by trustees, and with a zeal proportioned to her husband’s spirited design, completed the necessary purchases, buildings, and endowment. She survived her husdand nine years, died May 16, 1618, aged eighty-four, and was buried with her husband in the north transept of the church of Ilminster in Somersetshire, under a stately monument of alabaster, on which are their figures on brass plates; but the whole is considerably decayed. Mrs. Wadham first endeavoured to purchase the site of Gloucester-hall, now Worcester-college, but Dr. Hawley, then principal, refusing to give up his interest in that property, unless she would appoint him her first governor or | warden, she declined the condition, and made proposals to the city of Oxford, for the site of the priory of Austin Friars. This was once a place of great fame in the university, and may be traced to very high antiquity. In 1251, pope Innocent IV. granted a power to the friars eremites of St. Austin, to travel into any countries, build monasteries, and celebrate divine service. 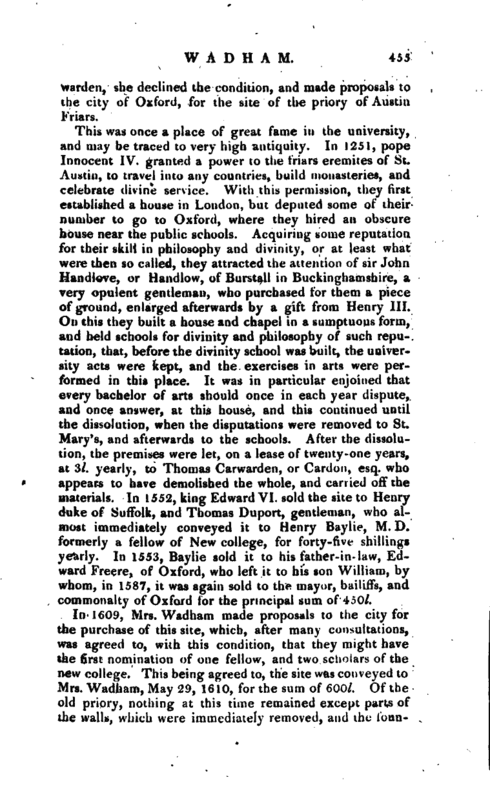 With this permission, they first established a house in London, but deputed some of their number to go to Oxford, where they hired an obscure bouse near the public schools. Acquiring some reputation for their skill in philosophy and divinity, or at least what were then so called, they attracted the attention of sir John Handlove, or Handlow, of Burstall in Buckinghamshire, a very opulent gentleman, who purchased for them a piece of ground, enlarged afterwards by a gift from Henry III. On this tney built a house and chapel in a sumptuous form, and held schools for divinity and philosophy of such reputation, that, before the divinity school was built, the university acts were kept, and the exercises in arts were performed in this place. 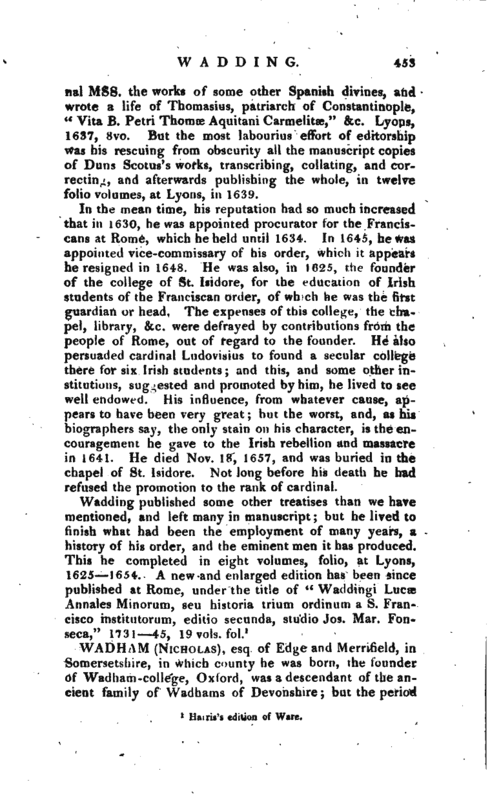 It was in particular enjoined that every bachelor of arts should once in ea^h year dispute, and once answer, at this house, and this continued until the dissolution, when the disputations were removed to St. Mary’s, and afterwaids to the schools. Alter the dissolution, the premises were let, on a lease of twenty-one years, at 3l. yearly, to Thomas Carwarden, or Carclon, esq. who appears to have demolished the whole, and carried off the materials. In 1552, king Edward VI. sold the site to Henry duke of Suffolk, and Thomas Duport, gentleman, who almost immediately conveyed it to Henry Baylie, M. D. formerly a fellow of New college, for forty-five shillings yearly. In 1553, Baylie sold it to his father-in-law, Edward Freere, of Oxford, who left it to his son William, by whom, in 1587, it was again sold to the mayor, bailiffs, and commonalty of Oxford lor the principal sum of 450l. In 1609, Mrs. Wadham made proposals to the city for the purchase of this site, which, after many consultations, was agreed to, with this condition, that they might have the first nomination of one fellow, and two scholars of the new college. This being agreed to, the site was conveyed to Mrs. Wadham, May 29, 1610, for the sum of 600l. Of the old priory, nothing at this time remained except parts of the walls, which were immediately removed, and the | foundation stone of the college laid July 31. On this occasion, the vice-chancellor, doctors, proctors, &c. came in procession from St. Mary’s church, and met the mayor and aldermen on the spot. Dr. Ryves, warden of New college, delivered an oration in praise of the founders, and the first stone was then laid on the east part where the chapel now stands. 1 Wood’s Colleges and Halls Chalmers’s Hist, of Oxford, vol. II.